The innovative Herr's snack company has yet another unique flavored potato chip. 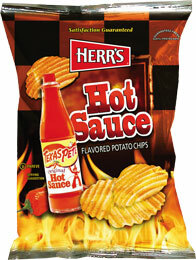 Herr's has teamed up with Texas Pete to create a hot sauce flavored potato chip. Each wavy slice of potato is fried and liberally seasoned with a spicy pepper blend inspired by Texas Pete. The combination of salty and spicy are a fine marriage in this chip. Texas Pete is a medium - hot Hot Sauce similar to Frank's Red Hot. 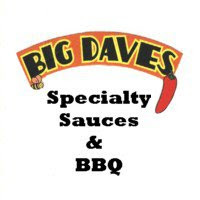 Produced in Winston-Salem, NC, the sauce is a staple in homes all over the South East. I've used Texas Pete on just about everything during my time in North Carolina. It adds just the right amount of heat to savory dishes. In powder form, the distinctive flavor and spice of Texas Pete are still detectable on Herr's chips. I've had hot and spicy chips from a few different companies, but I believe Herr's is the best. You can't go wrong teaming up with an excellent product like Texas Pete. These are the perfect chip for anyone that likes just a little (not a lot) heat. 4 Response to "Herr's Hot Sauce Potato Chips"
Just bought some of these today. Can't wait to try them. These chips are phenomenal! Toooo hard to put them down after you open the bag! !